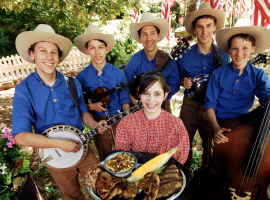 Silver Dollar City’s Bluegrass & BBQ Festival is always an event that people enjoy! From amazing music to delicious BBQ, this event is a favorite! The Bluegrass and BBQ Festival features a variety of Bluegrass entertainers. In fact, there are over 60 bands that will be performing during this time. Guests will get to hear many local bands along with a few big name entertainers. A few of these entertainers include: Flatt Lonesome, Rhonda Vincent and the Rage, and Ricky Skaggs and Kentucky Thunder. On top of the amazing entertainment, guests will love the delicious BBQ! During this festival, the Red Gold Hall is transformed into the House of BBQ! The House of BBQ will feature slow-cooked ribs, chicken, brisket, pulled pork, and a variety of sides! If you are looking for an all-you-can eat BBQ experience, head over to the Reunion Hall where can enjoy all of the BBQ you can handle. This meal is served family style and you will definitely not leave hungry! Another special event that takes place during the festival is the KSMU Youth in Bluegrass competition. Numerous groups compete to win this prestigious award each year and it is a great event to watch! The Bluegrass and BBQ Festival begins May 3 and runs through May 28. Click HERE to purchase a 2-day ticket for a special price!